It’s taken a little over a year and half for this make. It’s made up of a heck of raw emotion plus skill since my Mum started making it for me but never got the chance to finish it because cancer decided to take hold on her (f£&* cancer in every form). The coat itself is made of Harris Tweed bought from Fabric Focus alongside the silver paisley lining. Kevin, the owner of fabric focus has been eager for me to finish the coat but understood how emotional the make was. He always asked when I was going to finish it, very gently pushing me to do it! Sometimes I felt like working on the coat and sometimes not. When it got close to her Birthdays, Anniversary of her passing or Mother’s Day, I just had to put the coat down and only started working on it when I felt I could. It’s a bit like counselling (not that I’ve managed to go, nor feel quite ready for) but I know I’m working with mum on this on each step. It’s quite nice finishing it now just before this year’s “Mother’s Day”. Mum did most of the tacking (thank *%&@!) I hate tacking, I know it does wonders but I still actually hate doing it. Bagging the outer and the lining literally to played tricks on my mind but wanted a neat finish. Making sure that the outer and the lining were all level was time consuming but boy does it pay off! I don’t think finishing this coat would’ve been possible with the helpful tips and excellent guidance that I received from Abi, sewing teacher to both my mum and I, so thank you Abi for helping me on this journey. By adding little details such as the Kylie and the Machine “one of a kind” and Harris Tweed labels it really finishes it off. Also “One of a Kind” kinda puts a nice touch on the memory of my mum. Not to forget to mention the beautiful frogs that make that statement piece, also sourced from Fabric Focus. So here it is, in all its glory! Hey, I’m Emma and I have a blog over at www.sewdoitemma.com and I’m on instagram as @sewdoitemma. Firstly, I want to thank Tammy aka D&H Fabrics Co for giving me this opportunity to speak as part of the “Sewing is for Everyone” initiative and for gifting me some wonderful fabric, which I will talk about later on in the post. From my earliest memories I’ve always had something craft related going on. My Gran briefly had me into machine knitting with a mini version of her machine. Seamstress and a Tailor run in my mum’s Paternal and Maternal family tree, which is quite a humbling feeling. Any craft hobby that I’ve tried has been quite thearaputic for my well being, especially since I lost my Mum to cancer almost two years ago. Losing someone that close, leaves a void that just can’t be filled. In the last couple of years my dressmaking has accelerated after not really touching a sewing machine for most of my adult life. I was spurred on by getting annoyed with the fit and the quality of material used in retail fashion stores, especially the plus sized ones, at least in the UK. For example from season to season the fit would change, so I would find a fitting pair of trousers one season and the next season they no longer would, this was quite annoying. My acceleration in dressmaking would not have been the same without the phenomenal group of ladies that make up @Sew_Scottish. The foundations of this group were laid down at a meeting on a cold Sunday morning in November 2016, where after a brief conversation between myself and Lesley @sew_sleep_deprived, we both realised that we wanted to get a group of Scottish sewists together after seeing so many brilliant events being created South of the Border. Well, we managed to make it happen, and over the years we’ve organised a number of events and we’ve all gone on to become friends. It’s great to have a lovely group of people with which to talk all things sewing. Below is a snapshot from my wardrobe which is all handmade and I’m quite surprised at how much I have sewn. The RTW garments are slowly disappearing to new homes! Sewing has helped me gain confidence with my body shape. I’m about a 46′ bust and the same for the waist and then it just gets annoying with my hips being 57″ which means losing out on a lot of patterns both Indie and some of the Big 4 (but really 7, if you count them up!). Usually my bust and hips fit most patterns but the hips do cause a bit of a problem when I like a long top. In the last couple of months there has been a really important conversation about size inclusivity and how there is a feeling of being excluded from the indie patterns. I’m glad things are now slowly changing and I’m happy to be a tester for any pattern designer who wants to make a positive change to their brand and to other sewists’ lives. It hasn’t been easy though, this major topic was the starting point of so many different conversations, we all had to be mindful of keeping the main focus on the sizing issue and that voices were being heard. There were so many excuses why bigger ranges of sizes weren’t being done but often they didn’t stack up as there are pattern companies like Cashmerette that have been able to cater to a broader range of sizes, which has helped them gain a massive following. I know the feeling of being excluded all too well as I’m hard of hearing. Yes, I wear hearing aids but often when I have a lot of background noise the main conversation that I’m trying to keep up with gets lost. For example; take a busy bar add loud music and people trying to talk over it and then you see me with a dazed look on my face because my head is about to pop from the concentration that I’ve been giving trying to keep up with the groups’ chat. It all gets a little “under water” and “cloudy” for me after a while and hence that’s why I go quiet! I am generally up front to everyone about my hard of hearing and most people are brilliant, once I say that I’ll try to read their lips if they are face to face in a noisy situation. So that’s my story. Now without much further ado here is my make. Using the “Summer Time Poppy’s” cotton with the Amy Nicoles’ Roski Top I made this. In hindsight, (yah, it’s a great thing hindsight, isn’t it?) I should’ve used a Georgette or Challis for this pattern and not a woven as I feel it’s too stiff to allow the desired drape. But that won’t stop me wearing it when we hopefully get some warm weather in Scotland! And yes I shall be making another in the required fabrics! Myrtle Dress by Colette Patterns! Yes I finally cracked my Moneta obsession, don’t worry there’s plenty more of them coming with hacks but for the moment I’m trying out different patterns and I have a few exciting things that are happening but I can’t tell quite yet! Do I like and will I use the pattern again, if so will I make any changes? I love it, especially the cowl neck feature. I’d definitely use the pattern again but I would shorten the shoulders to avoid the embarrassment of showing of my assets too much! Where did I get the fabric from? I bought the lovely viscose jersey from fabric focus this winter, unfortunately for you I took the last 3.5 meters (sorry but not sorry) in fact, originally i bought 2,5 meters realised I didn’t have enough and the luckily there was 1 metre left when i went back to the shop – phew! Myrtle needs quite a drapey jersey and lightweight I’d say and for me it was a good skill builder. This was the first time I did a cowl neck and used the main fabric for a lining on the front and encased elastic in the skirt. For a quick make, once you’ve done it once it makes sense. Ok here’s the fun part – PHOTOS … Hooray! Now, where I’m I going to fit in time to do a woven version in this pattern? I love how this pattern is versatile like this! I’ve been thinking about going for it for a while and have finally taken the crunch! Also it’s my first day of my fabric buying hiatus! It gone well so far. I’ve put my time into doing this domain, house stuff and walking the dog. In my head I’ve got hundreds of ideas with what fabric from my collection should go with what project/pattern. Sure, they’ll be limits because of meterage/yardage or what type of fabric but I’m going to start to try and categorically organise them. This has been on the cards for ages but it’s not going to be easy with the amount of fabric I do have. First of all, I think I’m going to set fabrics and patterns that are in my make nine. Next I’m going to take all the fabrics out of the small Billy’s then (or maybe do a shelf at a time) measure, photograph and record each piece. Either spreadsheet it first and then add it on the Cora App, which I’ve had for yonks and not really made use of it. Once I’ve done the fabrics, I think I’m going to go through my big four patterns as I bet there’s patterns I’ve forgot about and have either doubled with a newer style or no longer “has that sparkle”. This could be another fabric destash as well but we’ll come to that bridge when it happens! This is going to be a long process for me as I am planning to sew a few things, some with deadlines and also I’ve got things that I need to do around the house (boo, hiss). Ok this is quite a ramble but it’s kinda good to put it out there and then you can see the difference when it’s done. Speak soon with hopefully some new makes! I thought it was high time for my blog to get a wee spruce up. It’s take me a while to figure out what I like, don’t like and for some creative juice to flow but I’ve got there. 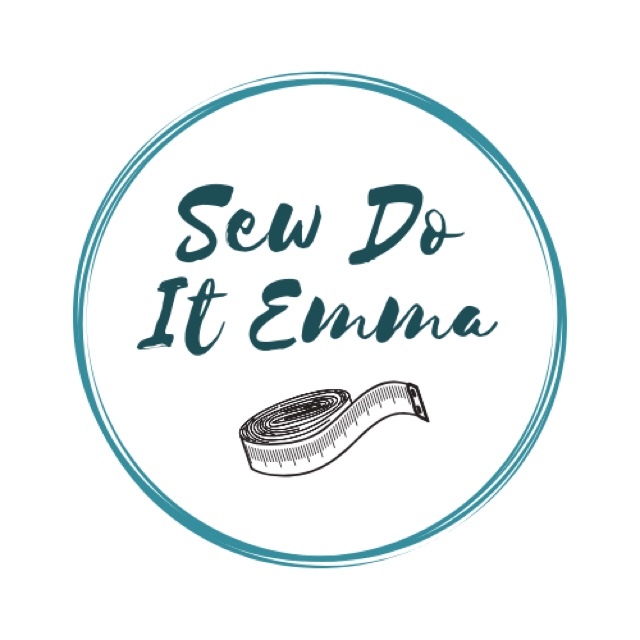 You may have noticed that there’s a fresh new logo, which I’m now also using on my IG @sewdoitemma. Using the Canvas App on my phone, I settled on this design. I feel it’s a lot cleaner and has simple lines. It’s amazing what you get up to at 6am after letting the dog out. With a new logo comes a new theme – I think I am finally happy with this one. Hopefully this will encourage me to write more blog posts as I’m really finding confidence with regards to using my sewing machine and overlocker and learning to sew with jersey/knits has definitely wetted the appetite! Currently I’m sewing up a line of Colette’s Moneta Dress … you could say I’m obsessed (the title gives that one away!). It all started with seeing the Moneta Party on IG way back when I first got the itch to stitch. It’s only take me a couple of years to summon up the courage to thread up the overlocker and have a go of this Jersey malarkey. Here’s a Summery of my dresses so far! First trip out was at Tantallon Castle! My mustard snag tights match up perfectly with this version! Wore to a friends exhibit opening night! Fabric: Fabric Focus, Sage green with floral design. Date night with the bestie for this one! Well that’s four so far and there’s at least another four to be sewn including a Christmas one, so watch this space and IG for more to come with other hacks (I love the scoop back hack!). Also I am going to put a couple of other stretch/Jersey pieces in between now and the rest of the Moneta’s so you don’t think I’m a one-trick Moneta! I’ll be talking about my next few projects in my make nine 2019 post soon! Ever since it was a pop up shop I was intrigued by The Wee Fabric Shop but the location made it slightly difficult for me to plan a trip as it was in Inverness! Now it’s a brick and mortar store situated outside the centre of Inverness which means I could plan a much more relaxed trip up. The sun was shining when I reached the shop front and what a lovely shop front it is (photos don’t do it justice)! Good thing about coming to this side of town is that you don’t have to worry about parking as it’s got a few spaces at the front of the shop and off street parking is available. Walking into the store I received a very warm welcome from Marice, One of the owners of The Wee Fabric Shop. It was so nice to meet her finally after seeing so much of the her and the shop on Instagram. It’s not one lady but three that own the shop, Claire and Fiona are part of the power trio! Their choices of fabric and patterns are on par and the quality is just brilliant- the only problem is that the trio can’t keep up with demand as sometimes the bolt sells out so quickly! (Trust me the quality is Devine!)! Oh boy! If you like indie patterns you’re in for a fine treat. Yeap – told you. It’s a Indie pattern heaven! Before you ask … yes I did buy fabric and patterns (I mean it would be rude not too!) I bought two knit fabrics and three patterns. Would I recommend? YES, hell yes! Ok I made a weekend out of it but it is worth the trip. It was so nice to meet Marice and Fiona. I wish them the best with the business, so far they’re on a very good path with such strong and amazing products to offer. Unfortunately I didn’t get to meet Claire but maybe next time I’m up the road I’ll catch her for a chat!